Abundance of broccolini in the fridge made way for this creation, plus a wonderful way to start off your week with plenty of green! Did you know broccoli and broccolini are actually members of the cabbage family and like their family members they demonstrate some amazing anticancer effects – particularly in breast cancer (Murray et al, 2005). These anticancer compounds are called ‘glucosinolates’ and in particular one called ‘indole-3-carbinol’ which we find in broccoli has been shown to slow the growth of both breast and prostate cancer cells (in preliminary studies). Incredible right? And to think you can munch down on this kind of medicine any meal of the day and it tastes awesome! Boil a large pot of boiling water, drop broccoli into the water for 2 minutes, remove from water and refresh in ice cold water then drain. This will help keep it fresh, green and crunchy. Whisk together all ingredients for the dressing. 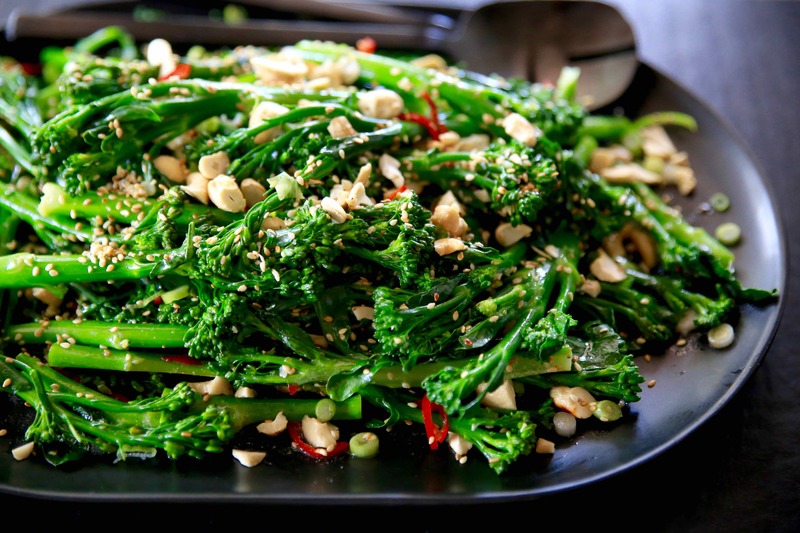 When ready to serve, simply arrange broccolini on a serving platter, sprinkle with chilli spring onion, cashews, sesame seeds and coriander leaves and stalks. Drizzle with dressing and season with sea salt and serve.